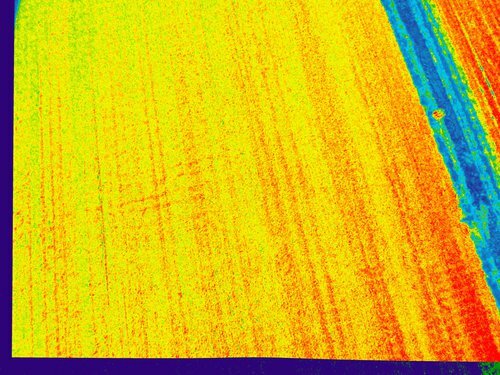 A while ago I made a ndvi picutre with two canon a2500 cameras. 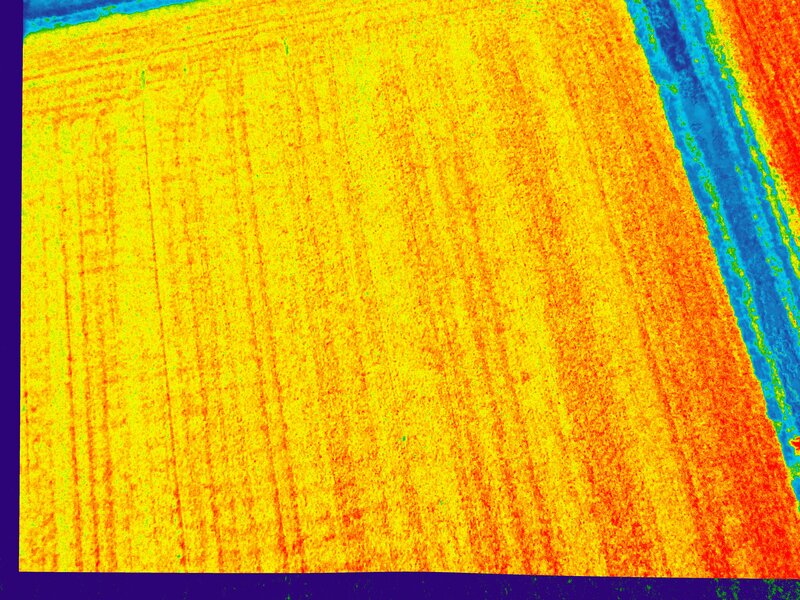 NDVI canon a2500. 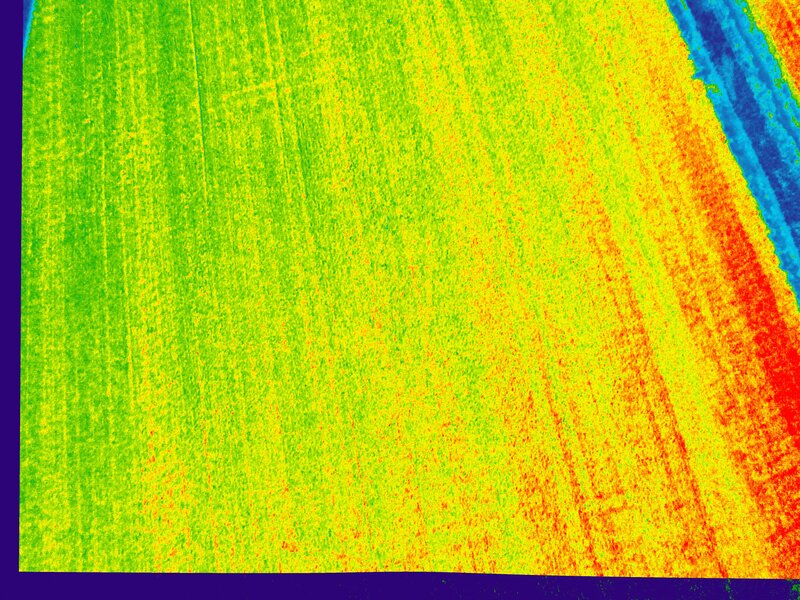 No I finish my quadcopter after a major chrash and I started making NDVI images with two cameras of a farmers field yesterday afternoon. What I notice is that multiple images from the same spot have diffrent indexes. Setup: 1. Two canon a2500 running both chdk with remote sync enabled. 2. One camera unmodified. Other camera the IR filter removed and a 850nm filter placed infornt of the lens. 3. Both cameras have there shutter speed set to 1/200. 4. There was a thunderstorm, in my hast I forgot to turn on RAW, the images are jpeg. 5. NDVI was made with Ned tool. 6, Drone altitude 80 meters 7. Drone speed 5m/s 8. Below images where taken after each other during flight. 9. It rain the day be before. 10. The Images where taken arround 20:30. 11. The images have overlay in the vertical direction, first two you can see the small tree. In the second and third picture you can see the dark horizontal lines which are below the tree. I made 72 images of the field. Most of them the colors are consistant, a little bit too red if you ask me. But here and there you see big diffrences in index colors, a spot may be red and in the another picutre the same spot is green. The question is why?? 1. Is it becuase I made the pictures at the end of the day where the sun was low on the horizon? 2. Shutter speed where lock. Did the camera for some reason decide change the white balance, iso? 3. Or these picutres do not mean anything because they are jpeg pictures and not raw. 4. Do I need to lock the ISO also. 5. Do I need to white balance the cameras?? Any other Ideas will help allot. Tomorrow the forcast looks good. I will make pictures of the same field with the same setting at noon. See if the high sun maks any diffrence. Need to fix this else the farmer will not take me serious. The NIR and visible images look a little different and that could be caused by a few factors. If any of the camera settings change between images it will effect the pixel values in the image. It's best if you can set a specific shutter speed, ISO, aperture, and white balance to improve consistency between photos. Any change in camera settings will change they the image. There can also be bi-directional reflectance (http://en.wikipedia.org/wiki/Bidirectional_reflectance_distribution_function) effects. Using RAW is arguable better but it probably isn't the cause of the effect you are seeing - unless you use auto-white balance and that is changing between images. If you take images at solar noon you will see another effect called the "hot-spot". You will likely see a shadow of your UAV near the center of the photos and the area around the UAV shadow will appear brighter than other parts of the photos. That's because the hot-spot is an area where shadows cast by objects on the ground a not visible since they are hidden by the object itself. At high sun angles you might also see an area on the photo that is susceptible to specular reflection. That would be obvious if you are flying over water. For aerial photography people tend to prefer moderate sun angles. This is interesting work and I encourage you to continue writing these notes. Experimenting with different options is a good way to learn. Ned, those are some great points -- would you mind if I used them as the basis of a new page at: http://publiclab.org/wiki/infragram-analysis ? Good point Ned. I'm going to lock everything in those cam. Event the photos are not good I love the sharpness. Ned should I use white background for both cam or a different color for the NIR cam. Ned thanks for your feedback, helps me keeping improving the NDVI. Interesting work indeed. I have a few partly formed thoughts: 1) since there is a thunderstorm, the illumination conditions are highly variable and transitory. It is very possible that the proportions the illumination in the different bands are very different from one image to the next, which could easily affect the NDVI 2) even supposing that the sky were clear, and emphasizing a little more Ned's comment about bidirectional reflectance: and taking a some wild estimates and guesses, if your latitude is 45 degrees north, at 20:30 if the sky were clear the sun would be at about 11 degrees above the horizon. It looks like the bottom of your images are nearly straight down, while the top might be at 30 degrees from straight down. Thus the angle of reflection from the sun to the camera might vary between approximately 80 degrees to 50 degrees from top to bottom of the image. Assuming that the crop is grain and mostly oriented vertically, this means that the image at the top of the screen would be closer to specular reflection and would be showing a greater proportion of unmodified incident light that at the bottom of the screen--more or less a weaker version of Ned's hot spot. This might cause the top of the image to show a smaller NDVI. 3) The 850nm filter pushes your IR imaging to the low end of the sensitivity curve for the CCD/CMOS sensor. On the other hand, wheat and grass (and many other plants) have strong reflectivity from about 750nm-800nm to below 1000nm (for instance see http://thor.dmu.dk/1_viden/2_Publikationer/3_Ovrige/rapporter/Artikel6_anne_LAND.pdf). You could get a larger biologically relevant response from the sensor with a 750 or 800nm filter, which might improve your NDVI. ttaylor you make some good points there. My cameras are not on a gimbal but directly connected to the drone (pure for kiss). Because of some gust the drone was not pointing in the same angle. I read your document, 720 nm looks indeed better. I have a 720 nm filter laying arround. Will try that. Thanks for the info. Have allot of testing to do. Will keep you guys posted. I usually use a gray target to white balance my NIR camera but I know some people use green vegetation like grass for the white balance. You can experiment and see what works best for your images.